A fundraising event to benefit The Lutyens Trust took place at the Residence of the Belgian Ambassador in London on Thursday September 17 2015. The Belgian Ambassador kindly offered to host the event, together with his wife Mrs Guy Trouveroy, because of the special relationship that exists between Belgium and the UK and the links of that relationship to Sir Edwin Lutyens. The chairman of The Lutyens Trust, Martin Lutyens, co-hosted the event. Eighty years ago, Belgium’s King Albert I died as a result of a climbing accident. Touched by the death of his nephew and, in recognition of the heroism and sacrifice of the Belgian Army in the First World War, King George V of Great Britain decided to bestow a unique honour on the Belgians never awarded to any other non-Commonwealth nation: a yearly Belgian Parade at Lutyens’s Cenotaph, the monument for the dead on Whitehall built in 1920 at the request of the then prime minister David Lloyd George. Belgium is the only nation that is allowed to parade its troops in uniform and bear arms in central London. 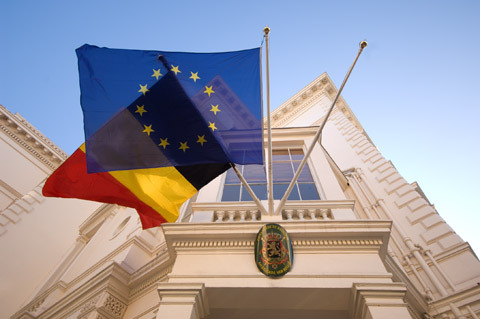 The Belgian Parade in London has taken place annually in July since 1934 on the Saturday preceding Belgian National Day. It is a strong symbol of the fraternity between the British and Belgian soldiers during and after both world wars, and confirms the close ties that unite both countries. Five of Edwin’s nephews died during the First World War; three lie buried on Belgian soil. The event consisted of two parts: first, a reception and presentation and secondly a dinner. The reception was followed by a presentation by Mrs Victoria Wallace, Director General of the Commonwealth War Graves Commission, on the work of the CWGC and its links with Edwin Lutyens. Owing to the exceptional generosity of the Belgian Embassy, all proceeds from the ticket sales went to The Lutyens Trust to help it further its work.